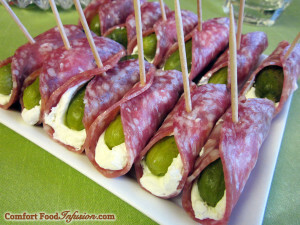 Or should I call them “Pickles in a Pig Blanket”? Ha! Anyhoo, this post marks the end of a very long hiatus from blogging. I have had a very busy couple months. Things are winding down a little. It’s so wonderful to have a week off from the hustle and bustle of school activities. I am going to try to post a few recipes this week. It would have been great if I could have posted these earlier, some of the recipes are great holiday treats and dishes that would help fill your Thanksgiving table nicely. This recipe is something I saw featured on a local news program. The morning show was hosting an appetizer recipe contest, and of all the wonderful recipes submitted, these were the winner. They deserved their award for many reasons: tasty, easy, creative, cute, kid-friendly. This is a perfect last minute hors d’oeuvre as well. I’m sure there are many of you out there who have been invited to a Thanksgiving feast and do not want to arrive empty handed. Simply pick up three ingredients at the supermarket, and you will arrive at the party with a snack that everyone will love. Be sure to make a lot! A simple, delicious hors d'oevre of mini dill pickles wrapped in cream cheese and salami. Spread about 1 teaspoon of cream cheese on each slice of salami. 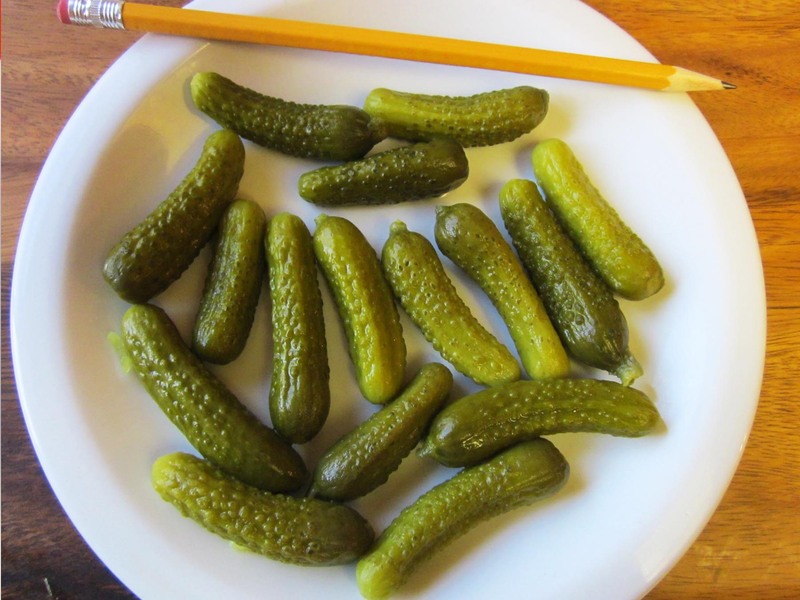 Top each with a dill pickle. Absolutely! Wrap them in saran wrap, or keep in a lidded container. They should be just as good the next day. Has anyone tried this with sweet pickles…? I haven’t personally used sweet pickles. But that actually sounds really good! 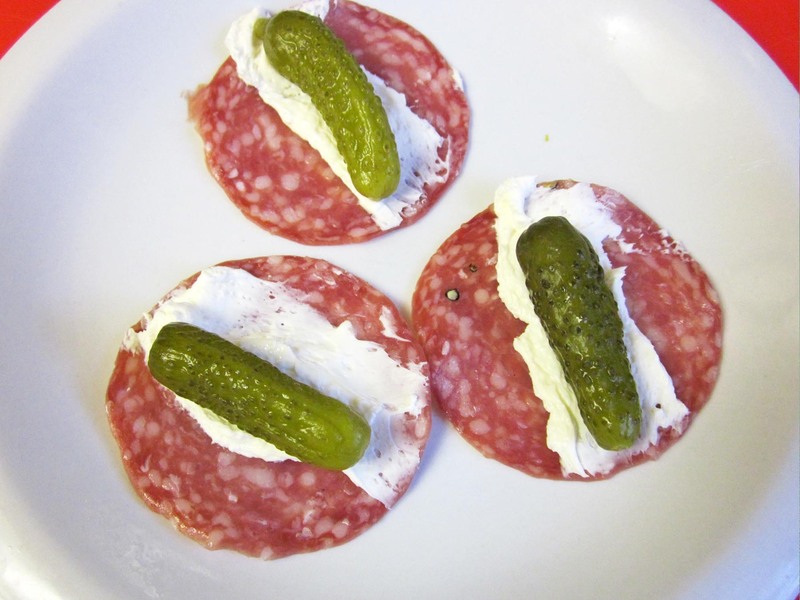 I think they would be especially good if you used a spicy or peppery version of salami. Our family has been making these for year. I was soooo surprised to see them on Pinterest. We make them with dill and sweet pickles. The sweet are always the first to go. I’ve been making these for about 20 years. I add horseradish to my cream cheese and I use Bread and Butter pickles. So good. Very interesting! That is worth a try. Thank you for the suggestion! Been a old favorite, you can cut the sweet pickle slimmer . You can also put green onion slice too.